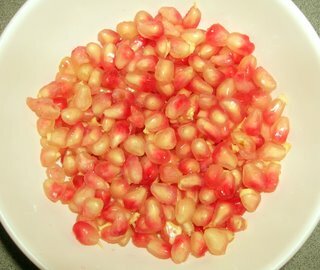 Grind the Pomegranate Seeds with Cummin Seeds, Green Chilli and Salt, to a smooth paste. Do not add water as the fruit has enough juice to grind. (The Paste will be a little Coarse due to the seeds and that’s okay.) Now add the mint and grind again until the mint is ground to a paste. 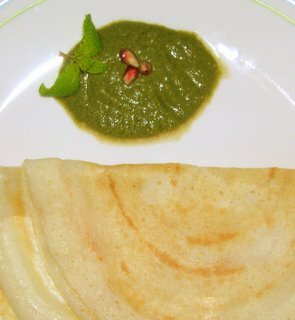 Chutney is ready in Seconds. No seasoning required. It’s a low Calorie and no Oil recipe for Dosa or Chapathi. 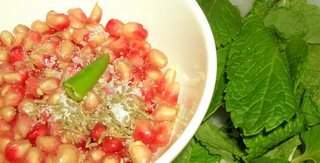 Mint and pomegranate...a very unusual combo...i might try this some time...i have a bunch of mint....all that i need is a pomegranate. Try and let me know if you liked it. I do have one more question on the lemon rice...U add lemon juice to hot seasoning along with salt..and when u add this to rice ...wont the rice taste bitter ? I add lemon to the hot seasoning, and the lemon doesn't taste bitter. May be because I am adding after I turn the heat down. Also, I add rice immediately after I give a stir.